I’ve had a few people ask about what I brought along with us on our travels this summer. When we initially took off for CA we just had carry-ons. For the most part, I kept the same clothes with me all summer. We’ve been trying to swap our wardrobe over to all fair wage/ ethically made clothing so you’ll see a lot of clothes from PACT Apparel. They’re a great organic cotton/ fair trade brand that’s based not too far from us. We do still have a lot of clothing from Lululemon. While I’m really bummed about the stance they’re taken on their manufacturing and treating employees, it’s stuff I purchased mostly 5+ years ago and is still going strong. I’m replacing things as needed with more ethical options. Top Left- rain coat by PrAna. I really wish I got to wear this more often this summer. I love this coat. It can dress up or down really easily and packs super small. Prana has an excellent lifetime repair policy and many Fair Trade certified products. Top Right- Sweater by Spendid. This was a gift, the company is made in the USA and this sweater is so comfy. I wore it on our travel days and brought it with me when we were going places with Air-conditioning since A/C often sets off a Raynaud’s attack. Bottom Left- Hoodie by PACT. I love all things teal. This was a great hoodie that I added the second half of our travels. The sleeves are really tight though so I’d probably go up a size next time. 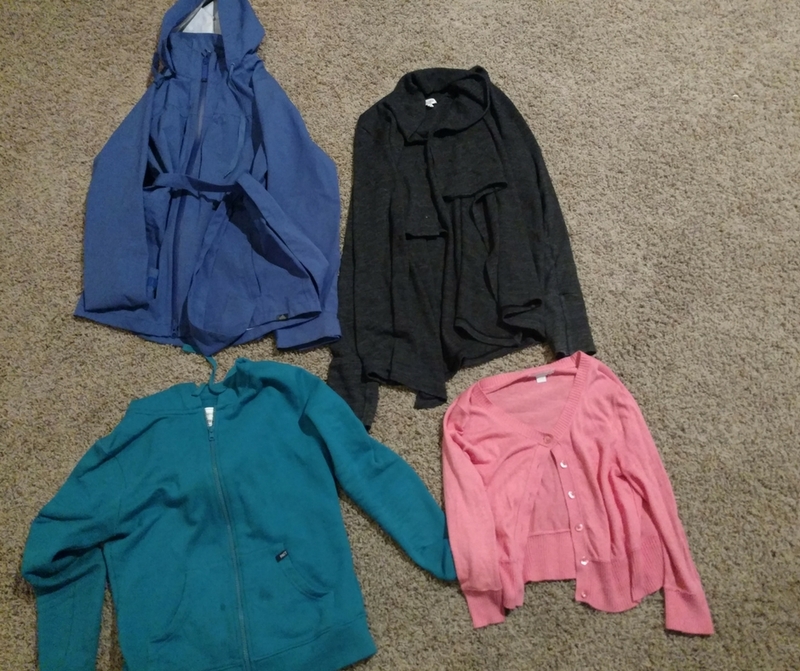 Bottom Right- Cardigan from New York and Company. This was a gift years ago. I wore it over a dress a couple times. Next time I’d leave it home and save the space in my bag. Not pictured- V-neck shirt from Threads for Thought. This was a black v-neck top my Mom got me a few years ago. I love to layer it and lost it somewhere between Sacramento and home. Boo!! It’s a great piece for a minimal wardrobe. T-shirt from church– Our church gave out shirts to all the volunteers. I’m not picturing it because it has our hometown and the church name listed and I don’t want to give out that much information. It was a good casual shirt for hanging out around my folks or the motel. Left- Shelf-bra camisole by PACT. I could maybe write a blog dedicated to this tank alone. It’s super cute, comfy and goes with so many of my other clothes. I got dozens of compliments in this tank. It’s the “squash blossom” print and was totally an impulse buy that I don’t regret one bit. I also brought along self-bra white and black tanks to layer under my shirts and dresses instead of a traditional bra. These tanks also have adjustable straps which a petite girl like me needs! 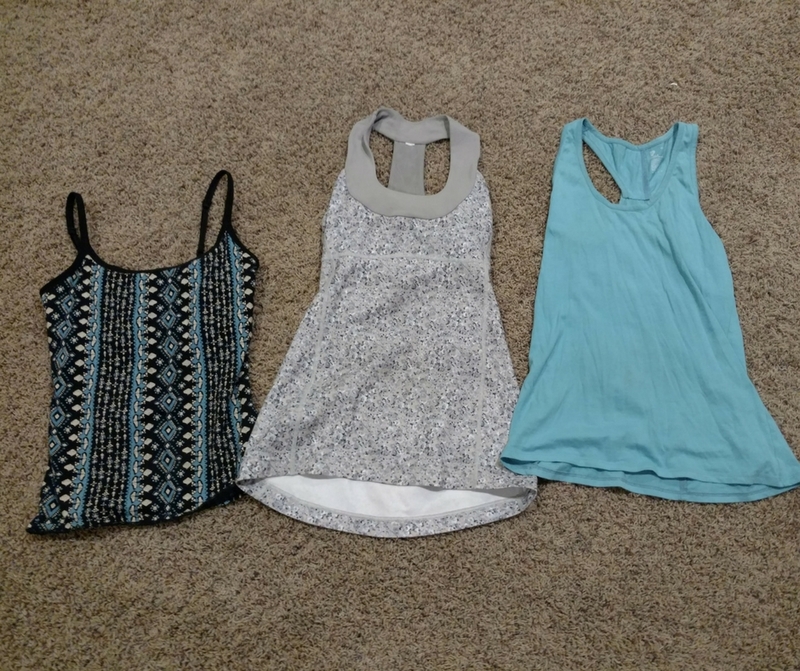 Middle- Tank by Lululemon. Cute print, dries fast and lightweight. The only complaint I have is that the band for the shelf-bra is TIGHT and after wearing it all day it left me with a line. It’s also long enough to wear with leggings. Right- Racerback tank by PACT. I got this for FREE on a BOGO PACT had with Whole Foods right around my birthday. I love the color, length (also good for leggings) and that it goes with lots of things. I wore it over the other PACT tank a couple times too. My Mom did have to help shorten the straps for me which is a common problem on tanks. Right- Khaki shorts by Lululemon. These are really lightweight and don’t wrinkle. On past trips I’ve worn them a lot, I didn’t find myself wearing them much this summer but I was glad to have them for when I wanted them. 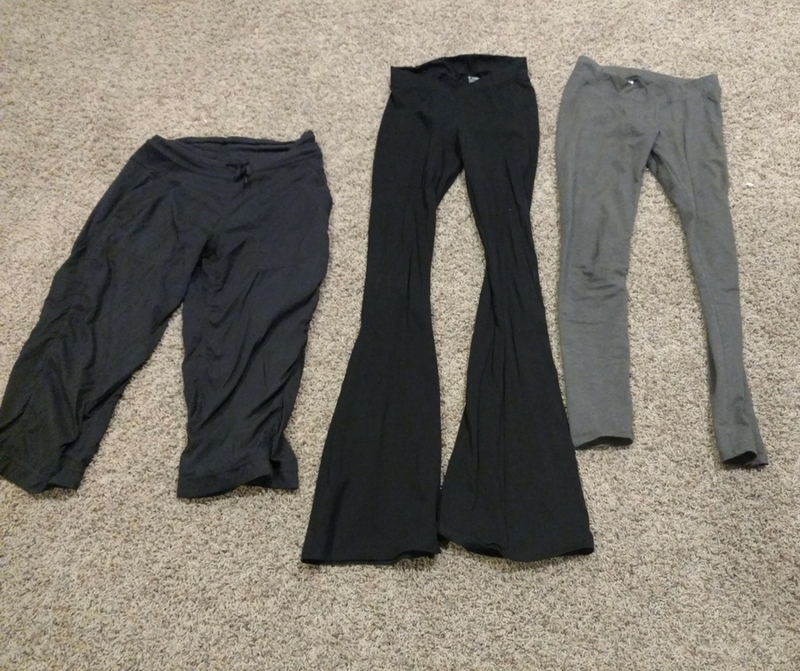 Left- Capris by Lululemon. These are another item I’ve had since before my son was born that I wore my whole pregnancy. They’re comfy, lightweight capris. I probably wore these most this summer. Center- Stretch-fit Flare Pants by PACT. My favorite item. These were great for travel days, yoga, the few days I was sick and lounging. Super soft fair trade organic cotton and the flare on the bottom is really cute. Left- Leggings by PACT. Super soft and comfy. 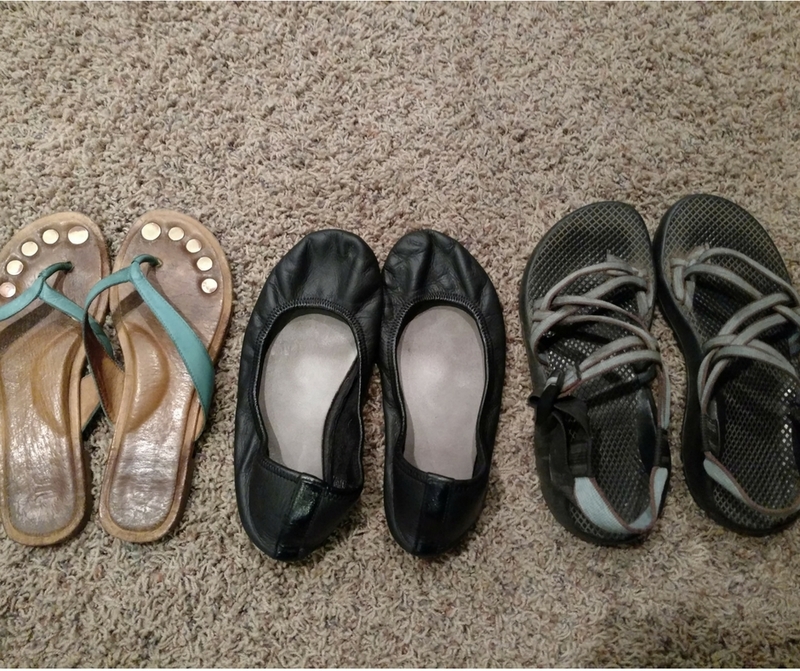 I swapped them out when we came home mid-summer for my black PACT capri leggings which also got lost along with the black shirt. I love these pants but it was too hot to want them much this summer. I’ll probably wear them a lot in the fall. I did wear them quite a bit with my longer tops. For future leggings, I might choose to get one size larger. At home I mostly wear dresses all summer. I didn’t find myself wearing these much this summer because we were frequenting places w/ A/C and my legs got too cold. I did like having them though and would probably choose to bring them along. Left- Sundress by Susina. A friend gave me this a few years ago and I love it. It’s a cute pattern, fits well and I usually get lots of compliments with it. I wear the pink cardigan pictured above over it. Plus it has pockets!!! Right- Wrap dress by PACT. This dress is my little-black-dress. I wear it all the time and love how comfy it is. It’s easy to dress up or down and I like being able to change up the straps. I’m thinking about getting a second dress in a different color to wear around the house so I’m not worrying about ruining this one. Left- Flip flops by Juil. This company went out of business last year. Lots of people had issues with their fit, none of the other shoes I purchased from them fit right but these flip flops fit like a dream. I wear them all the time and will be sad when I wear them out. Center- Ballerine flat by Softstar. Stay tuned for my ode-to-Softstar post. These are super minimal, incredibly soft and comfy shoes that are handmade in Portland, Oregon. The bottoms are really soft (similar to toddler moccasins) and they’ve helped my back pain substantially. I will replace the flip flops with some of their sandals when the time comes. These dress up or down beautifully and fold up super duper small. The only downside is that they’re leather and get hot. I want to get a pair in their LITE material to see if it breathes better in the summer. Right- Chacos. I’ve had these for at least 10 years. Got them at the REI garage sale for $7 before my hubby and I were married. Since my feet are used to Softstars these tend to hurt my back because they’re so firm. I mostly wore them anytime I thought I would be around water since the other 2 pair of shoes were leather. It might be my last summer for chacos. Underwear- I brought 7 pair of undies. Mostly PACT and a couple pair of Patagonia quick-dry undies. Bags- I brought my teal Osprey backpack and teal shoulder bag as well as my tiny black Sherpani purse. I didn’t really use the purse much as we were out and about for long days and I needed more space. Accessories- I wore my regular rings and brought along 1 necklace and my Buff headband. I wore the Buff a ton so I was grateful to have it! Overall I was really happy with my minimal summer wardrobe. Things mixed and matched really well and I had lots of items that packed small. What would you bring along or change? and also conscious clothing (consciousclothing.net)! it’s my favorite right now, but definitely not cheap!